The latest from Dave's mind to you. Hey again everyone! This is the first Board Breakdown, where I’ll be going into detail about a different board model each time. This time: the Turbo Ripper. Why the Turbo Ripper first? Simple: it’s consistently been one of my top 3 selling board models, and – if you follow my Instagram (@daveyskysurfboards), you may have noticed an overwhelming number of Turbo Rippers lately, as it’s become our #1 seller over the last few months. So I figured it would be a great board for the first Board Breakdown. If I had to describe the Turbo Ripper in one word: FAST. This board, probably more than any other board in the model line, is designed most heavily specifically for classic New Jersey conditions – heavy, fast, drainy, dredgy. I wanted to design a modern performance based shortboard that could consistently make and beat out sections while still maintaining the affinity for performance maneuvers. The Turbo Ripper is insanely easy to paddle and catch waves, and on the wave face many of my customers have described the Turbo Ripper as having “an extra gear”. In fact, a lot of my customers who have Turbo Rippers have told me they had to recondition their brains to go from thinking “Okay make the drop and high line it and pump pump pump pump” to “Alright I can make a bottom turn and make a top turn!”, and I’m SO stoked to get feedback like that, because that was the whole point and concept behind the Turbo Ripper’s design. So what makes the Turbo Ripper so fast? A combination of it’s rocker, concaves, rails and tail. So, yeah, pretty much everything, hahah. But it all comes together really beautifully. 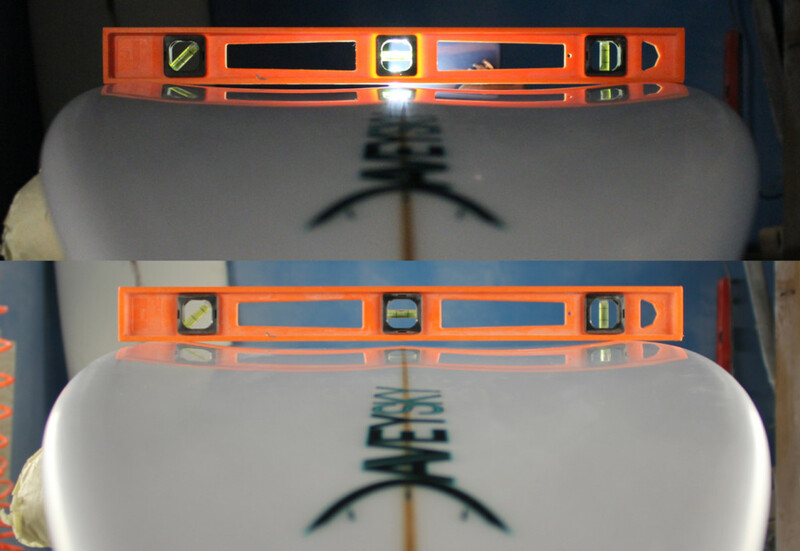 The rocker is actually opposite of the general trend in hybrid and performance hybrid shortboards, which is lower nose/entry rocker and exaggerated tail/exit rocker and flip. That generally makes for a somewhat easy paddling/wave catching board, but once up and on the wave, the ability to drive and create speed is limited due to the heavy tail rocker – which does generally allow for good in-the-pocket surfing – but tends to require a slightly slower breaking and more predictable, consistent wave. And boards with that type of rocker certainly have their place are are great for that style of wave. However, my goal was to tackle a faster, rainier, dredgier less predictable wave. 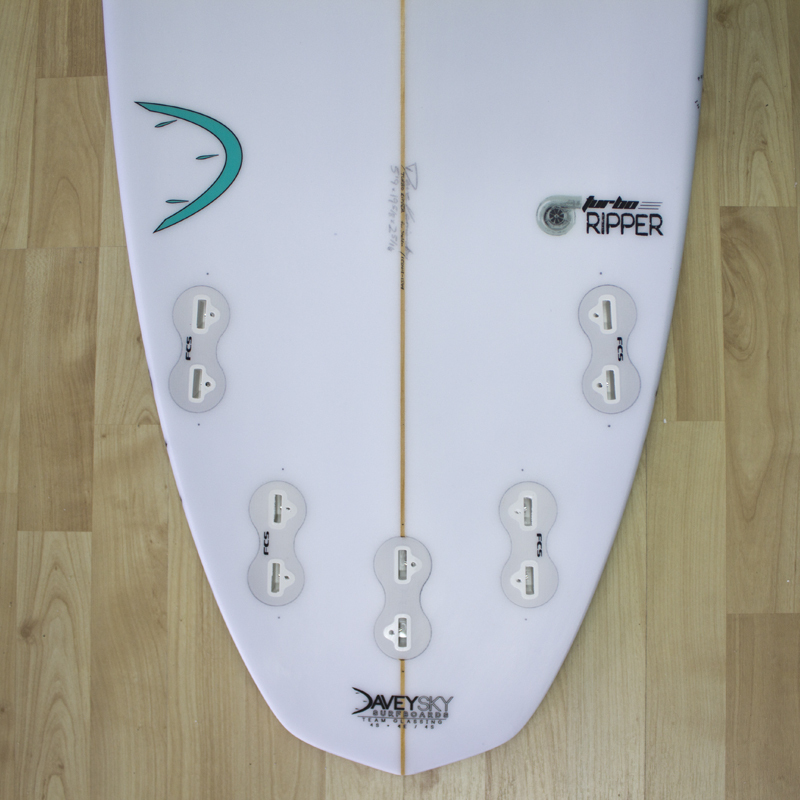 Therefore, the Turbo Ripper has a slightly relaxed nose and entry rocker and a relatively low exit and tail rocker. That allows for the board to handle the steepest drops New Jersey offers without the nose catching, and once on the wave face, screaming fast drive, acceleration and top speed. The concaves also play a serious role in the “driveyness” of the Turbo Ripper. The deep double-within-single concaves almost the entire length of the board essentially preloads your rail(s) to pump and drive, as well as channeling water specifically to your engaged rail fin(s). I always refer to the concaves of the Turbo Ripper as its engine. Normally, a lower tail rocker means less forgiveness/”control” in the pocket. And, while a board model like The Dream that has a more standard high performance tail rocker will indeed more naturally fit better in the pocket, the Turbo Ripper can still handle it extremely well. This is due to the rail rocker, outline curves, and diamond tail all working together. The very curvy outline and curvy rail rocker in combination with the diamond tail (read: slightly shortened rail line) and concave water control allow for excellent, fast in-the-pocket control, especially considering the reduced tail rocker. The final part – the rails. The rails are definitely a bit unique compared to the usual performance “c” rail found across a majority of shortboards in any given surf shop. They almost feel like a down rail in your hand, but they’re not. They feel that way due to the deep concaves, as well as the volume distribution throughout the rail. The rails have a bit of a tighter radius in the bottom half of the rail (leaving a touch more foam there), creating more volume in the bottom half of the rail. This creates a more stable ride, a fast reacting board (especially while driving). It should be noted that it’s not the world’s most forgiving rail – it probably takes a comfortable intermediate surfer and up to really appreciate the rails, but they do really dial in your form and surfing pretty quickly. I could have made the rails a touch more forgiving like a normal performance “c” rail, but it would have detracted from the intended result of the board design. Don’t be afraid of the rails! They don’t take much getting used to – if any. They are designed to improve your surfing. Whenever the waves are shortboard-able, I ALWAYS have the Turbo Ripper in the car when I go for a surf check. And, when on a performance based shortboard, I’m surfing the Turbo Ripper probably about 75% of the time. When we get fresh, heaving storm swell (about 2′ overhead and up), I’m on either The Dream or the Pipe Dream…but when it starts to mellow out a bit and becomes a bit more “manageable” (4′-6′ is it’s money zone; aka spring and fall), I never hesitate to switch to the Turbo Ripper. P.S. The Turbo Ripper isn’t JUST for New Jersey -it also works wonders at breaks around the world. It’s saved the day on some mushy groundswell days in places like Puerto Rico, Nicaragua, Costa Rica, and Hawai’i and some smaller, disorganized windswell in Outer Banks, Florida, California, etc.